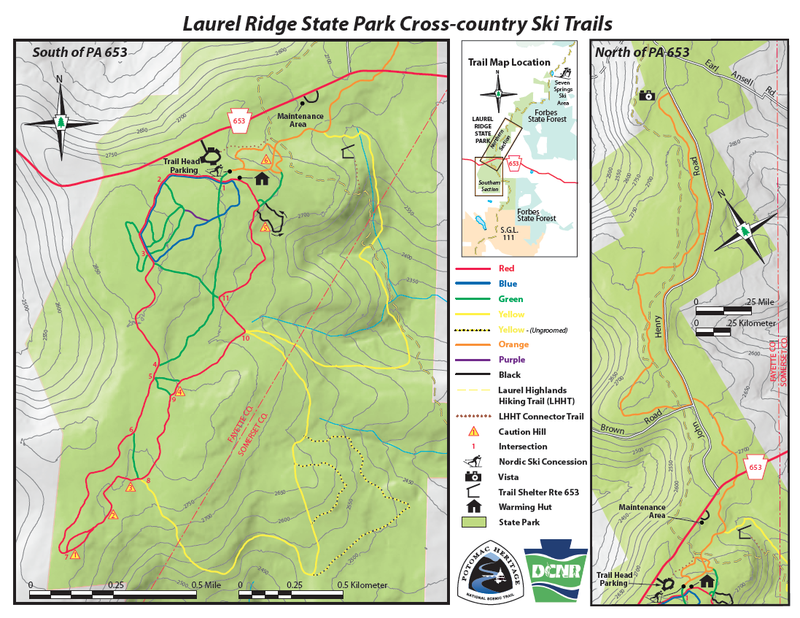 The new cross country ski trail map for Laurel Ridge State Park is available for download here It shows the trail extensions completed this summer by Scott Rugh and EADS Group Inc, funded by the PACCSA/DCNR grant from Fay-Penn. The new black trail (expert) is for advanced skiers only, whereas the new entrance to the orange trail (intermediate) creates a more gradual incline down the hill to reach the rest of the orange trail. There is a more detailed report about this project in the November 2012 PACCSA newsletter. The map also shows the purple trail (easy), which was added last year by PACCSA (Bob Mazur and Yellowjackets families) and DCNR. The purple trail enables skiers to make a gentle 1km loop without encountering any big hills. The small red numbers on the map show the location of key intersections on the red trail, marked in situ by red and white numbered signs. The ski trails were mapped by the park staff, who hiked the trails whilst carrying GPS equipment.